Trying to figure out how to accept recurring payments with WordPress? Recurring payments are awesome for your bottom line because they guarantee money coming in every month (or week…or whatever interval you want!). But their recurring nature also makes them a little bit more complicated to set up in comparison to one-time payments. Don’t worry, though! You’ve got plenty of options when it comes to how to accept recurring payments with WordPress. And in this post, I’m going to share four easy solutions to help you start accepting recurring payments in no time. Whether you want to use PayPal, Stripe, or an entirely different payment gateway, you should be able to find what you need on this list. And, while you certainly can use these recurring billing for any type of repeated paymnt, if you’re a web professional who resells our WordPress maintenance plans to your clients, these solutions will let you put your clients’ recurring maintenance payments on autopilot. Ready to start building that recurring billing revenue? Let’s dive in! A good option if…you just want an easy way to accept basic recurring payments and don’t need broader eCommerce functionality. 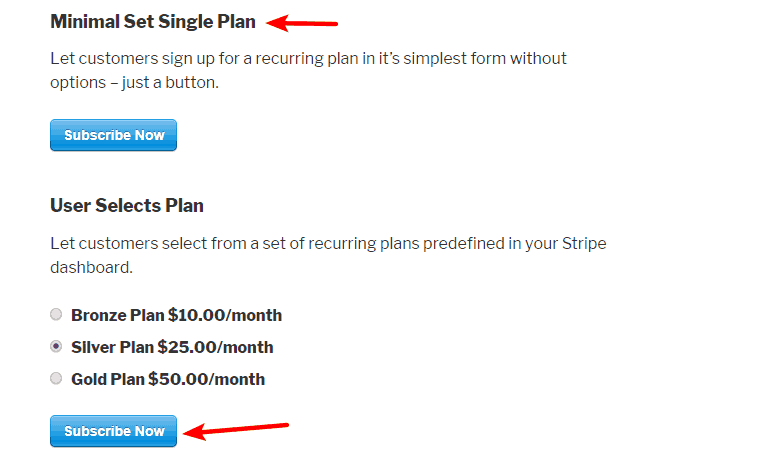 As the name suggests, WP Simple Pay is a simple way to start accepting recurring payments via Stripe. If you’re not familiar, Stripe is a popular payment gateway that makes it easy to accept credit card payments (or other methods) with competitive fees (2.9% + $0.30). One of the big perks of WP Simple Pay is its ease of use. Through its own streamlined interface and the Stripe interface, you get access to a really beginner-friendly recurring payments solution. 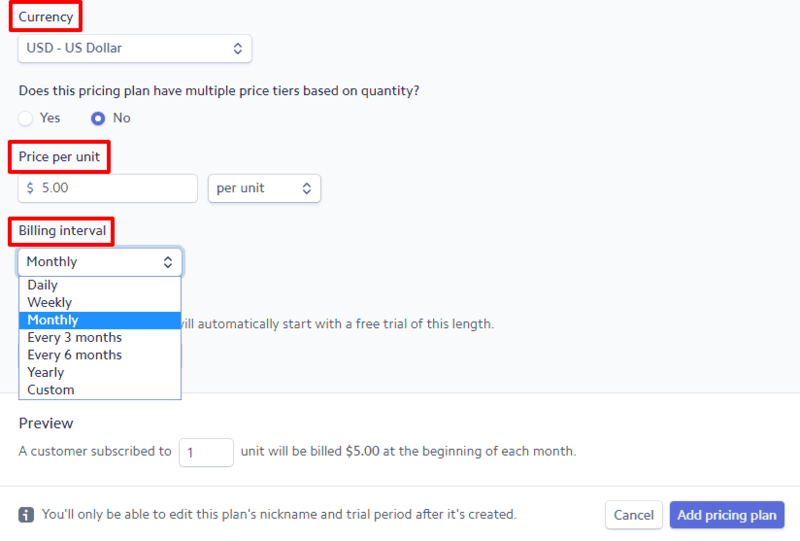 Then, once you add your pricing plan in the Stripe interface, you can select it in WP Simple Pay and easily embed a button/form on your WordPress site. And you can also view the live demos here. While there is a free version of WP Simple Pay at WordPress.org, you will need the $99 WP Simple Pay Pro Business plan for subscription payments. A good option if…you need more control over your subscription payments, either in terms of payment gateways or functionality. WooCommerce is the most popular WordPress eCommerce plugin, as well as the overall most popular platform to build an eCommerce store (that is, even more popular than platforms like Shopify). While it has all the functionality needed to create a full eCommerce store, you’ll also find plenty of people using it in a more targeted fashion. One example of that more targeted fashion is…recurring billing! Can get pretty creative with your subscription products. You can even stack on other WooCommerce plugins, like the WooCommerce Product Add-ons extension. Can set up recurring payments for other plugins, like a membership plugin for membership sites or an LMS plugin for eCourses. The potential downside, though, is that you have to install the entire WooCommerce plugin. So if you just want to create a few basic subscriptions, that’s a lot of features and code that you don’t need. Overall, a good approach is to make something simple like WP Simple Pay your first stop. But if that doesn’t do it for you, using WooCommerce and WooCommerce Subscriptions will give you access to more flexibility. The WooCommerce Subscriptions plugin starts at $199 for use on a single site. A good option if…you just want a simple way to accept basic recurring payments and don’t need broader eCommerce functionality. 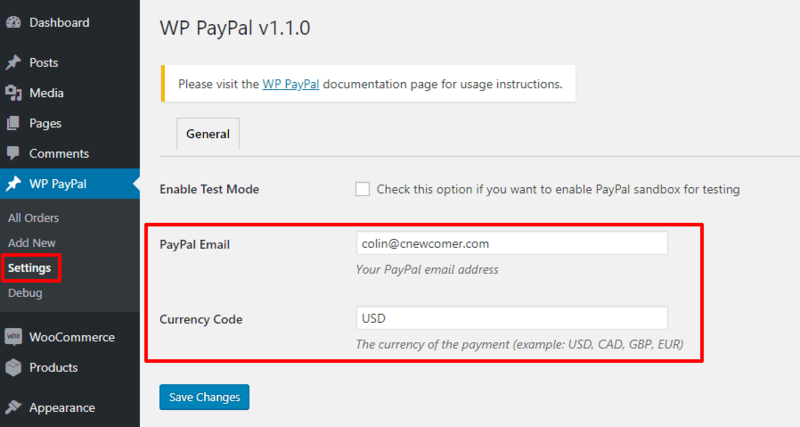 WordPress PayPal is another simple option to accept recurring payments on WordPress. It’s a lot like WP Simple Pay…but for PayPal. All the shortcode options are documented on the plugin’s page. Beyond being easy to use, another nice benefit of this method is that the plugin is 100% free. Like WooCommerce, Easy Digital Downloads is a full eCommerce platform, though it leans more towards digital products than WooCommerce. With the paid Recurring Payments add-on, you can create digital products with automatic recurring payments. Choose from a variety of popular payment gateways, including Stripe, PayPal, 2Checkout, and Authorize.net. Integrate with other Easy Digital Downloads add-ons to create more customized subscription products. 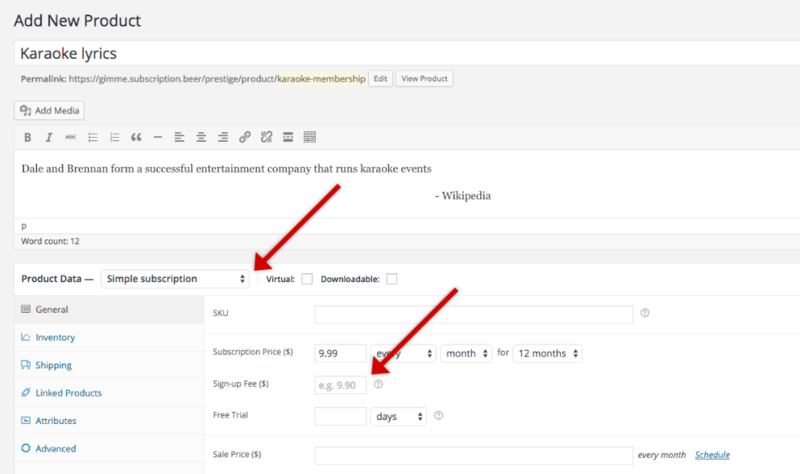 Connect to other types of plugins to create recurring payments, including most popular membership plugins or LMS plugins. So if you’re going to go the eCommerce route for recurring payments, why might you choose Easy Digital Downloads over WooCommerce? I think the main benefit is that Easy Digital Downloads is a bit more lightweight and streamlined because it focuses exclusively on digital products (which is what most recurring payments are). But the downside is that you lose access to the huge marketplace of third-party WooCommerce extensions. 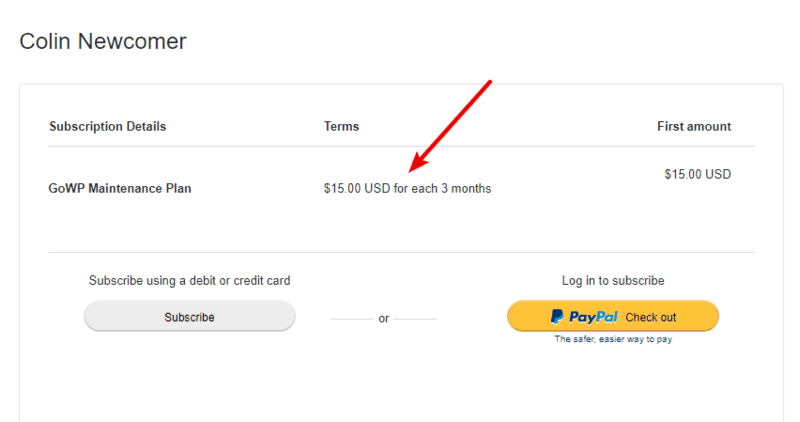 If you want to accept recurring payments with Easy Digital Downloads, the Recurring Payments WordPress add-on is $199. A better option, though, is to purchase the Extended Pass, which also costs just $199 and includes the Recurring Payments add-on as well as all the available payment gateways. Start Accepting Recurring Billing Today! And there you have it – four easy ways for you to start accepting subscription payments with WordPress. If you just want a simple solution, your best bet is to go with WP Simple Pay for Stripe or WordPress Paypal for PayPal. And for more complicated recurring payments, an eCommerce plugin like WooCommerce or Easy Digital Downloads might offer a bit more functionality.